Make Twilight Invitations for your Twilight Party! You can Make Twilight Invitations for your Twilight Party! Wait until you see the free printable paper that fit into the Twilight Theme perfectly...like Edward and Bella! These are beautiful patterns that you can print out, one even has an apple on it...now does that scream Twilight? Are you a Twilight Collectible freak? Need a gift for a Twilight fan? Then take a look at these fun items I found! Just click on the picture for more information. Everyone will want to know "Your Secret to Making Twilight Party Invites"...you can tell them...if you want to! I've got to warn you once you send out invites on these beautiful sheets everyone will know what an Obsessed Twilight fan you are...it's okay...I am too...I just love to talk about the movie, the cast, the books, the characters...and of course, Twilight Party ideas! These patterned pages are called Clair de Lune...named after the song Edward had in his CD player the day he brought Bella to his home to meet his family. Remember? He was surprised that she recognized the music! That was right before the fated baseball game where Bella and the Cullen Coven met James, Laurent and Victoria. It's worth planning a party around these invitations, they are just so perfect for the Twilight theme. Everyone is going to be so surprised when they find out you made these invites yourself...and you can tell them where to find them...Or not! It can be your secret! When I first published this article, the papers were the free special of the week. Since that time they are now in the store section of the site www.retrodiva.net. 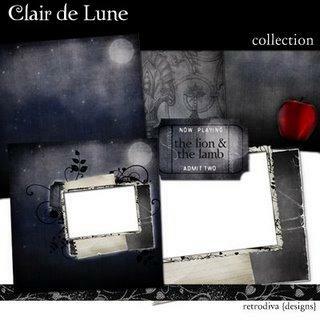 I don't make any money from this site, but I still have to mention it since the Clair de Lune papers and elements are so perfect to make Twilight invitations for your Twilight Party. I think the price of each is about 3.50, and you have to look in their store. If you click on the link below, go to the shop at the top of the page to see them. There are other papers available to you weekly and you might find some free stuff there that you can use. They change the freebees often! Twilight Paper Designs for Twilight Invitations!